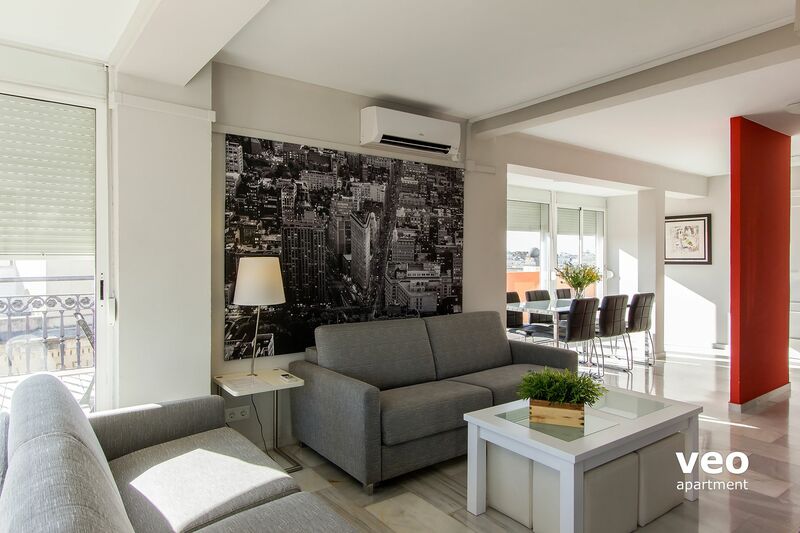 Wonderful penthouse with two comfortable bedrooms, 2 bathrooms and a "L" shaped terrace running the length of the apartment. 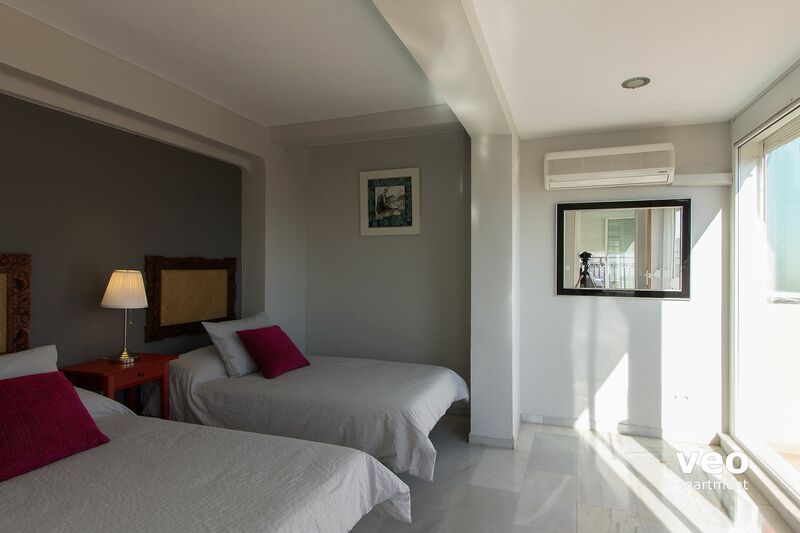 It is centrally located just a minute's walk from the Cathedral and the Alcázar Royal Palace. The modern style living room has 2 sofas, a coffee table and TV. Adjacent to the living room there is a dining area with a large table and chairs. The open-plan kitchen is well equipped with utensils and appliances for self-catering. 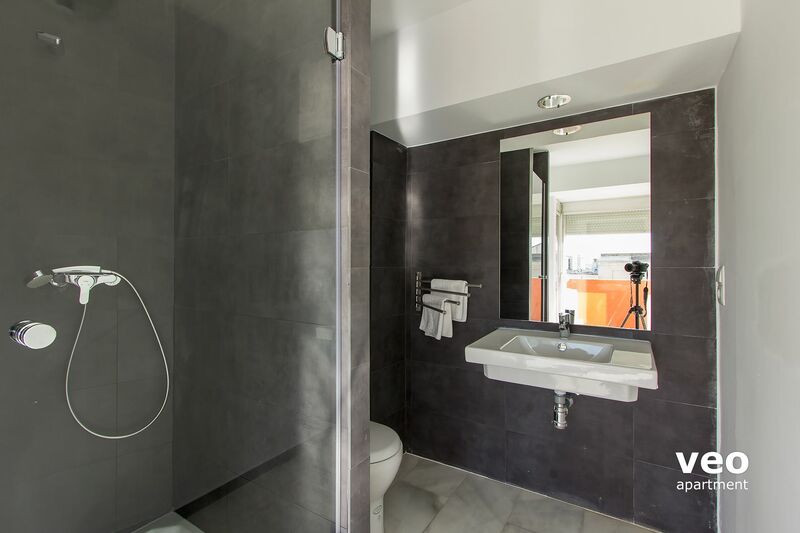 Next to it is the first of two bathrooms with shower. The master bedroom has a double bed, wardrobe and en-suite bathroom, complete with shower. The second bedroom features two single beds and a wardrobe. In the living room, the sofa can be used as a double bed for 2 additional guests, completing the apartment capacity to lodge up to 6. Other features include wi-fi internet connection and air-conditioning (hot/cold). 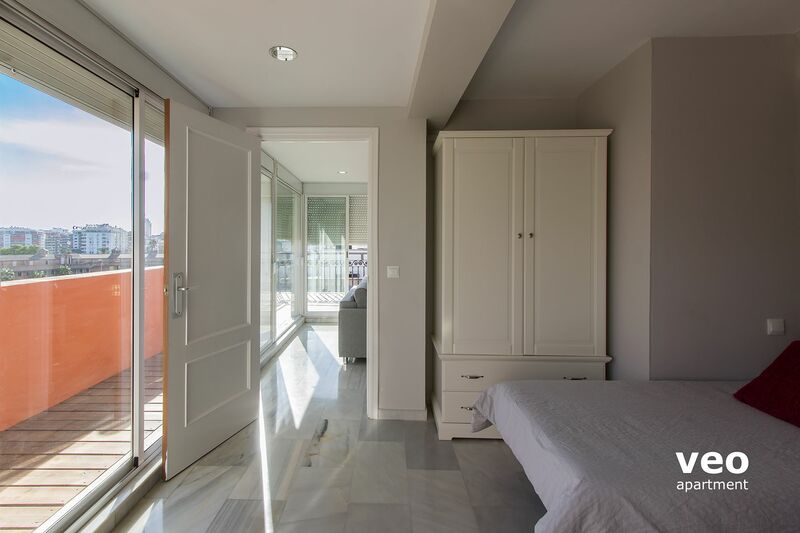 All rooms have large glass sliding doors which open to the private terrace - allowing in plenty of light and breathtaking, ample views over Seville's historic center. 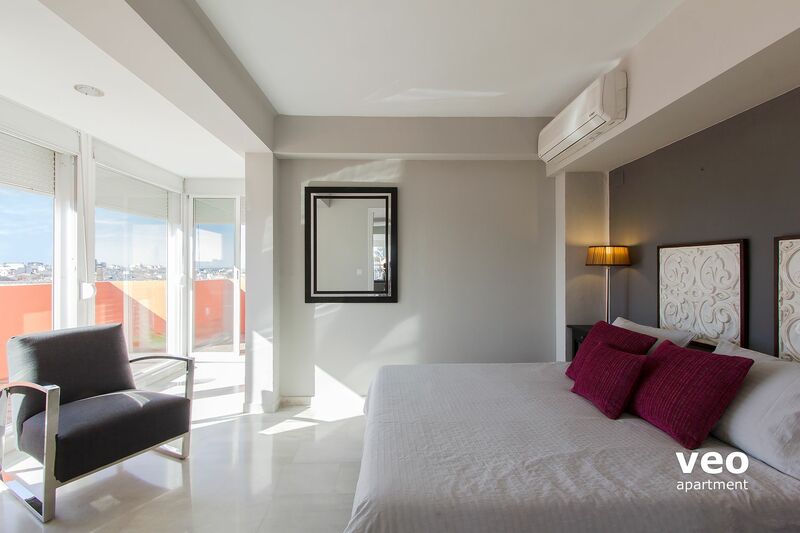 The apartment belongs to a set of 6 beautiful holiday flats, in a building composed of studios, one, two and three-bedroom apartments. 15:00 - 22:00h. Early/late check-in is possible but subject to availability. Late check-ins after 22:00h have an additional charge of 20 EUR. "Beat up but great location"
The video on their website should get an Oscar. Just what we expected based on the website. Perfect for our family of four. 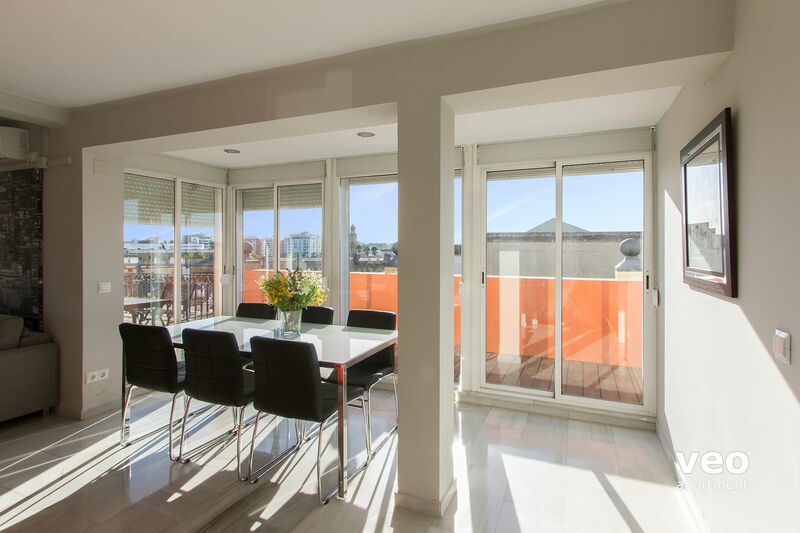 "Great apartment and terrace, and great location!" And a better equipment in the kitchen. "Très bel appartement clair et ensoleillé"
Nous terminons un très plaisant séjour familial à Séville rendu encore plus agréable par ce bel appartement même si de légères améliorations sont nécessaires : problème d'eau chaude dans l'une des douche et un lavabo se vidant difficilement. De plus des doubles vitrages semblent aussi nécessaires. Bravo toutefois à l'agence pour l'ensemble de l'organisation. "Apartamento supercéntrico y luminoso con una terraza estupenda"
Apartamento de ubicación inmejorable, luminoso y cómodo. Hacer mención que, sólo para las personas especialmente sensibles con los ruidos,en el dormitorio principal sientes el ruido de un motor que debe ser el hidro, por lo que suena durante la noche de modo intermitente. 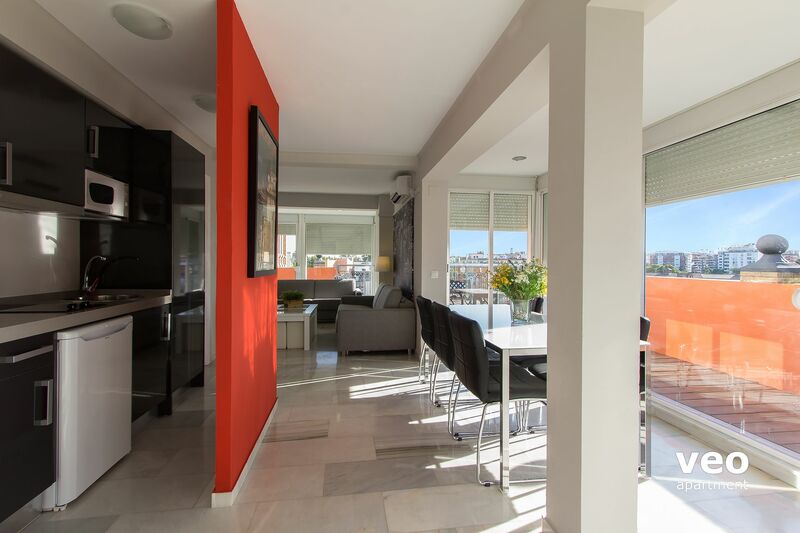 "Fabulous Apartment right in the centre of Seville"
We loved this apartment which was so central it was easy to get everywhere in Seville. It was modern and comfortable with everything we needed - including the air-conditioning which was vital in 42 degree heat. We particularly enjoyed the outside space which was lovely to relax in after a day's sightseeing or to have breakfast in the sun before starting. 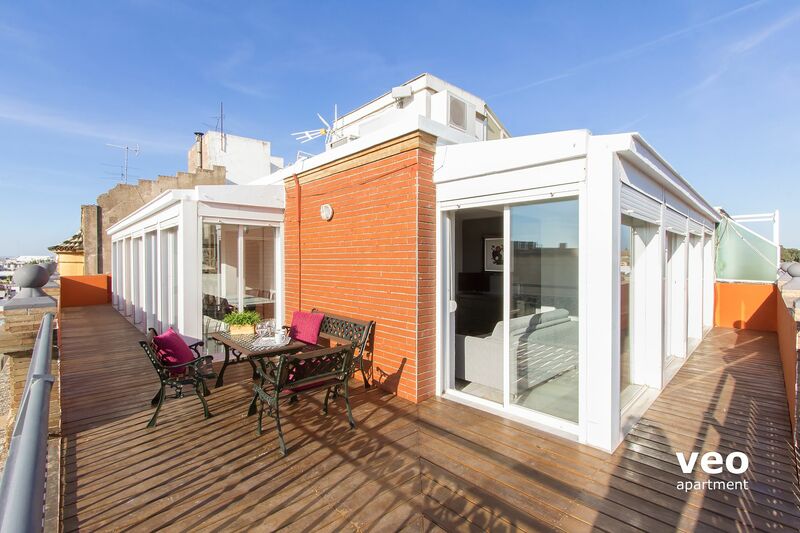 "Awesome apartment with the most gorgeous terrace!" The apartment was perfect! Only missed having bathroom toiletries.. only basic hand soap was provided.. no shampoos or a moisturizing lotion etc which is pretty much basic stuff in all apartments I have stayed previously! 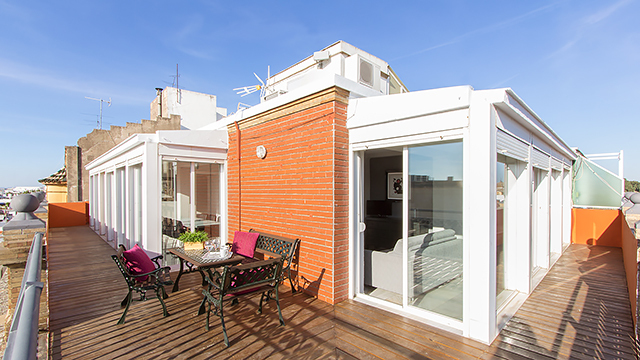 We absolutely loved the apartment, terrace, location and pretty much everything else though! 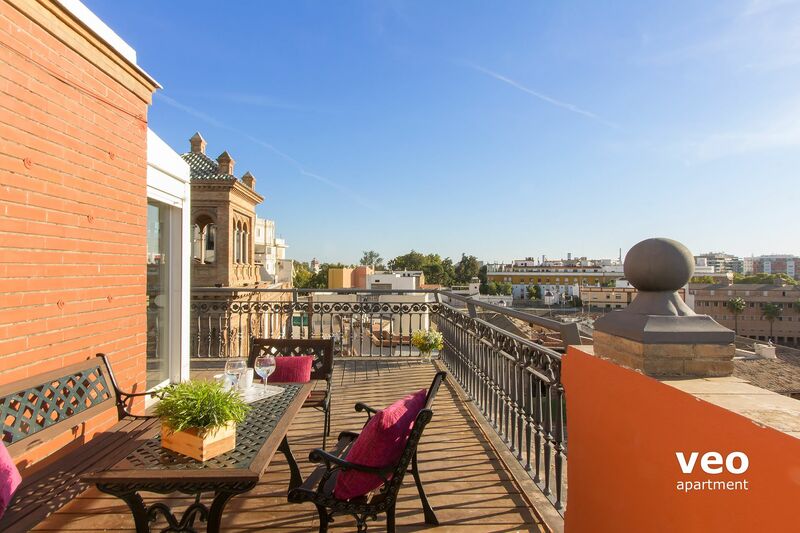 Perfect location for a stay in Seville to enjoy all its wonders. Right by the Cathedral which is a must see. We walked everywhere. The outdoor space was wonderful to have on beautiful evenings and it had a great view. 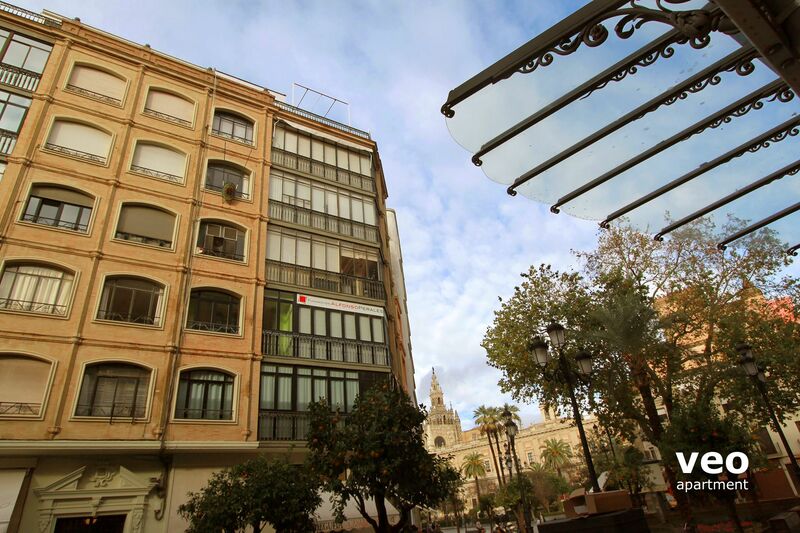 "Great Place to Stay in Seville"
A very comfortable apartment in a great location that represents great value for the money. It was extremely hot (45C) while we were in Seville, and it was so nice to be able to easily go back to the apartment to cool off and relax, but then easily access restaurants and attractions when we were ready to venture out again. Appartam centralissimo e comodissimo tenuto bene e anche pulito....meglio di cosi nn ci poteva capitare. Unico neo la mancanza di una piscina xche con quel caldo ci avrebbe fatto piacere fare 2 tuffi!!!! The apartment was beautiful and well kept. Location is central to main attractions. Was not able to get in touch with the contact to get the key for some time. Otherwise great stay. "Accueil très sympa. Emplacement super." L'appartement est très agreable. Juste mettre une housse sur les canapés car ils sont sales. Beaucoup de bruit pas de double vitrage, quel dommage. "Fantastic location with terrific views"
We loved the location, and layout of apartment worked for 4 of us, I wouldn't like to sleep 6 though. We were able to use the balcony a couple of time though we did experience significant rain whilst we were there so with door left open we did our fair share of mopping, the only slight downside was the divider between the kitchen and dining room table. Made working there a bit squashy. All in all a terrific stay and I would stay here again for a special occasion. La localización de este piso no podría ser mejor. Disfrutamos mucho de la terraza por la noche cuando estaba más fresco. spezielle Ferienwohnung für den Städteurlaub! 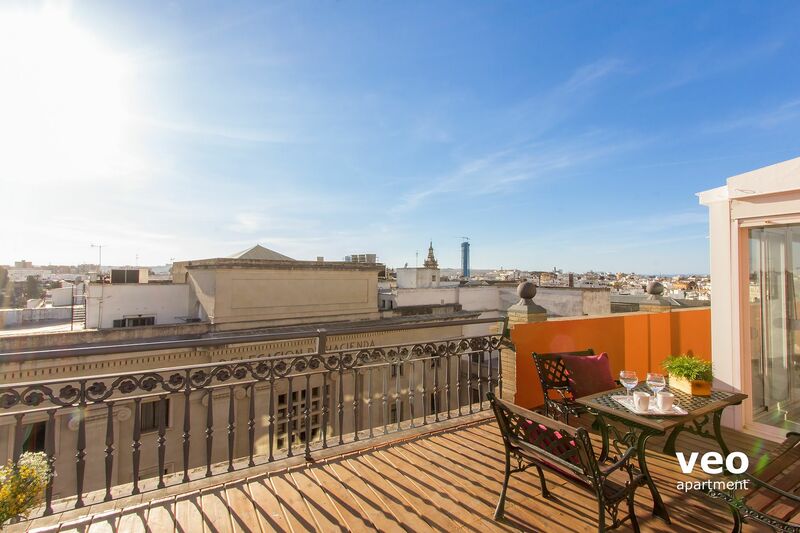 Wonderful location in the heart of the old town. 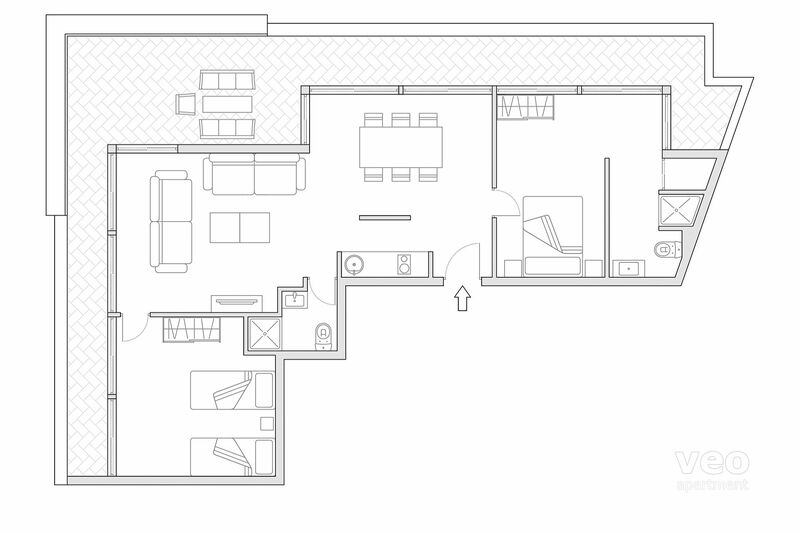 Clean apartment but kitchen ill equipped and too small for more than 2 people staying. A lot of noise within the apartment building due to renovations and lift noise. Cheap sofa beds too uncomfortable to sleep on and uncomfortable to sit on when made into lounges for day use. "Situation exceptionnelle dans le centre historique "
Appartement agréable avec une belle terrasse,bien équipé et décoré. Il manque quelques éléments de cuisine pour assurer des repas légers à domicile et surtout une bouilloire!! On peut tout faire à pied.Il est à noter que l'appartement se trouve dans un quartier très vivant. El apartamento está situado justo delante del edificio de los Archivos de Indias. Cruzas la Av. de la Constitución y ya estás en la plaza de la Catedral. Es cómodo (te sientes como en casa) y decorado con gusto. El único inconveniente es que no tenía ni servilletas ni mantel. 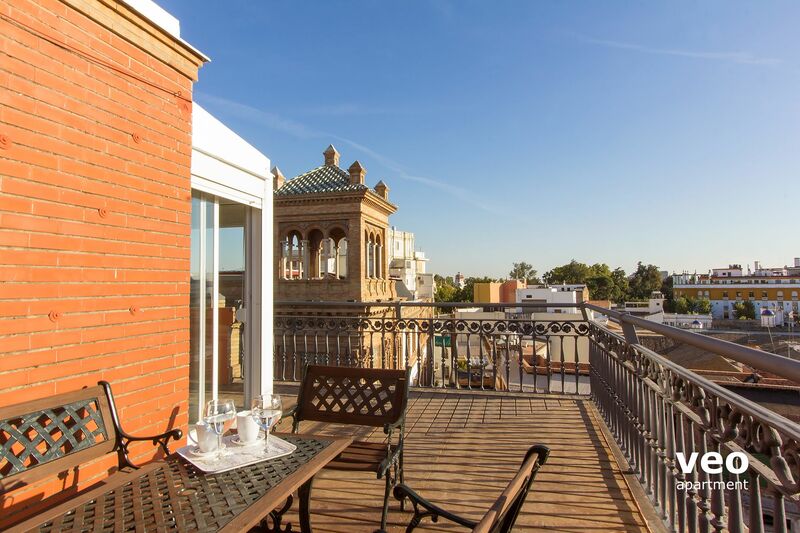 "Fabulous Apartment in Seville, great views!" Wonderful apartment with great views. Rooms were very clean, well equipped. Check in process was fast, but a little difficult with the language. We only spoke a little Spanish, but check in person spoke no English at all. Comfortable beds. 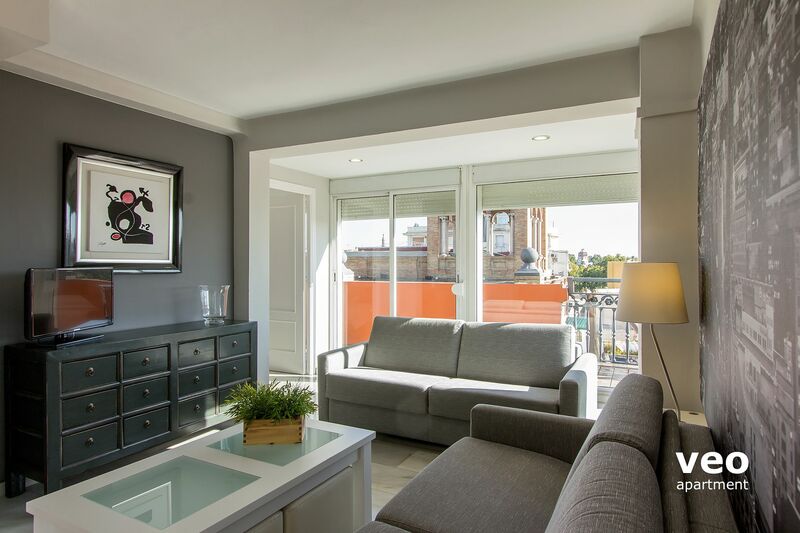 "The perfect location in a great city"
From the punctual collection via your contacts Seville Services we spent a memorable 5 nights at the apartment. It had everything we could possibly need [except we couldn't find the iron !] 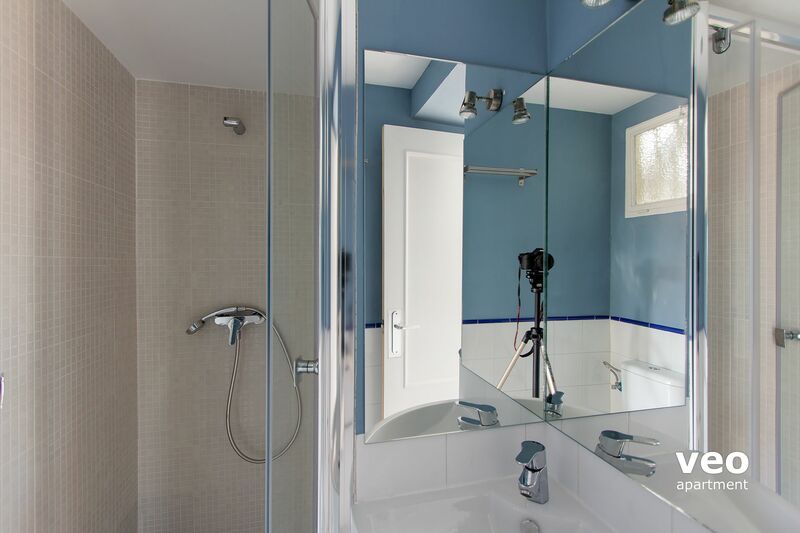 it was impeccably furnished and the slight problem we had with the water running away in the shower and w/c was dealt with extremely quickly and efficiently by Carmen. We would thoroughly recommend this apartment to anyone. El apartamento nos pareció estupendo, con unas vistas impresionantes y tal y como lo habíamos imaginado por las fotos de internet. Lo malo es que del grifo de agua fría salía agua caliente. The spacious apartment with wrap around deck was well situated near attractions and restaurants with lovely views. Arrival and departure were very easy, although if you have a car, be aware it is on a pedestrian only square (easy parking nearby, but had some confusion with the GPS driving instructions). My only complaint is that the air conditioning unit in one of the bedrooms was very noisy and dripped onto the bed when in use. I hope I am fortunate enough to stay here again! 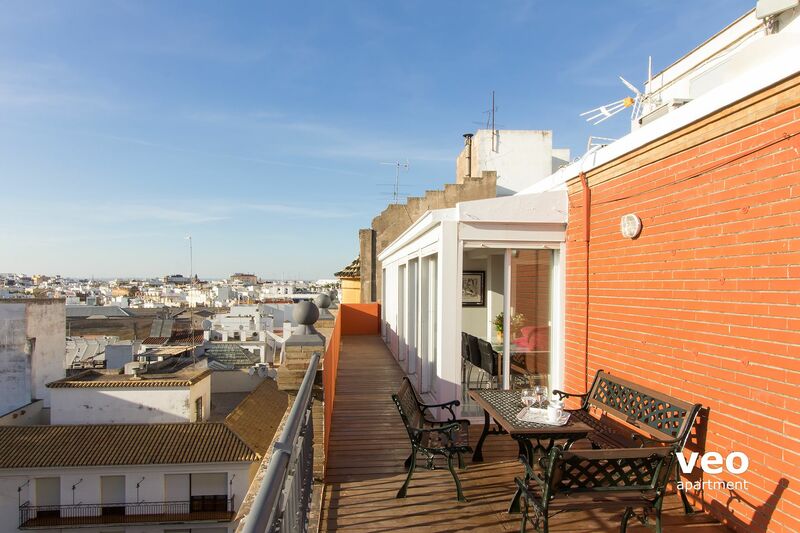 "Convenient Apartment for Sightseeing in Sevilla"
The apartment was centrally located, close to the cathedral, alcazar and restaurants. It was perfect for our family. We enjoyed having wine on the terrace after the sun set - it was too hot during the day to enjoy the terrace. "Au cur de Séville dans le ciel bleu!" Central, pratique, bien équipé, bien adapté pour 4 a 6 personnes, accueil très serviable, immeuble gardé la journée (consulat belge dans l'immeuble), terrasse magnifique. "Le top ! en plein centre de santa cruz !" une petite critique quand même: sous équipé au niveau du matériel de cuisine. Quand on a une terrasse aussi agréable on a envie d'y manger et donc de faire un peu de cuisine. Pour 5 personnes il n'y a pas assez de grands plats et grandes casseroles.et autres ustensiles. El apartamento estaba muy bien situado, cerca de la Giralda, la Torre del Oro, el teatro Alcázar... pero para 6 el precio era elevado; hay que tener en cuenta que era Semana Santa... Por otro lado, el sofá-cama no era muy cómodo. "Great Location and View from the Top!" 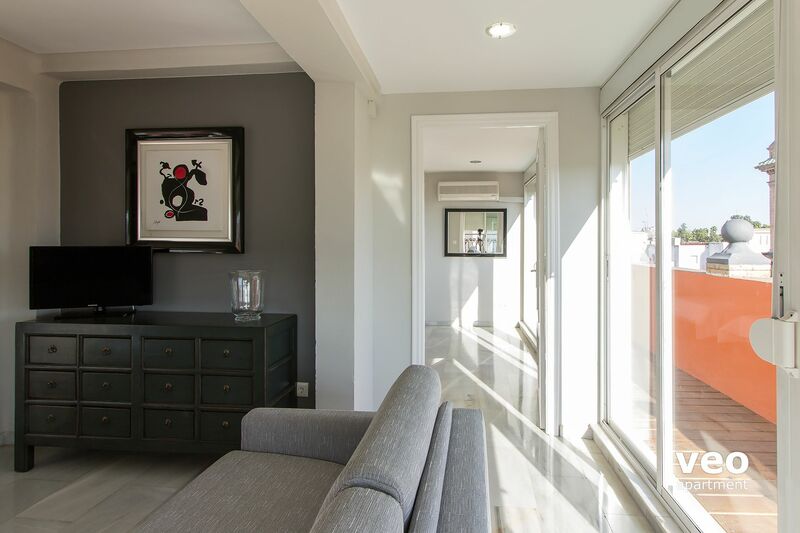 The apartment was clean and modern with beautiful views from the many glass walls. The washing machine worked well and the elevator was very nice to have. Carmen was a pleasure to work with and the doorman was very nice as well. 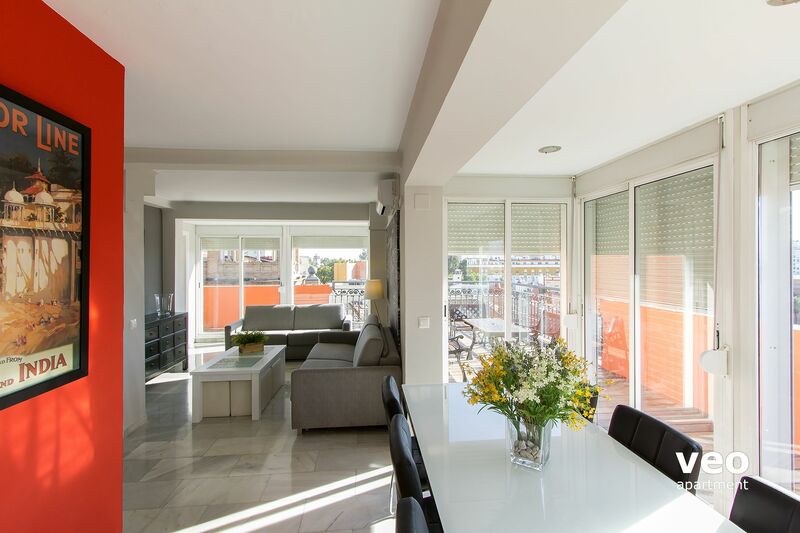 The location of this apartment was excellent for visiting many of the famous must see tourist sites in Seville. There was a super market within 2 minutes walking distance away and several bakeries, Dunkin Doughnuts, nice restaurants close by. "En pleno centro y con una terraza espectacular!" 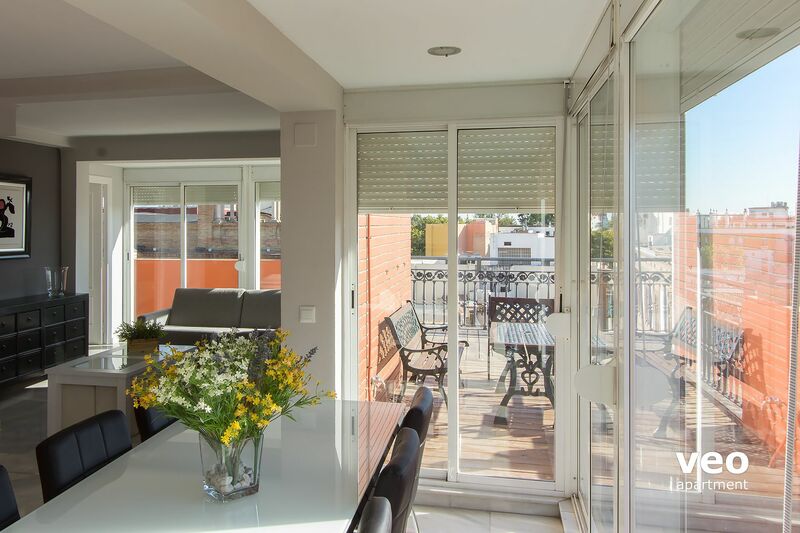 "Un bel appartement avec vue dans le centre historique de Séville"
Cet appartement moderne et confortable nous a beaucoup plu, avec sa terrasse qui en fait le tour et offre une très belle vue sur Séville. Tour ceci à deux minutes de la cathédrale, de l'Alcazar et près du quartier Santa Cruz. Il manque un peu de vaisselle et de récipients pour cuisiner pour 6 personnes. Autrement nous étions très satisfaits. Muy buena ubicación, excelentes vistas y terraza.